A poster of the KleinHacks event. Image courtesy of the official Klein Hacks website. 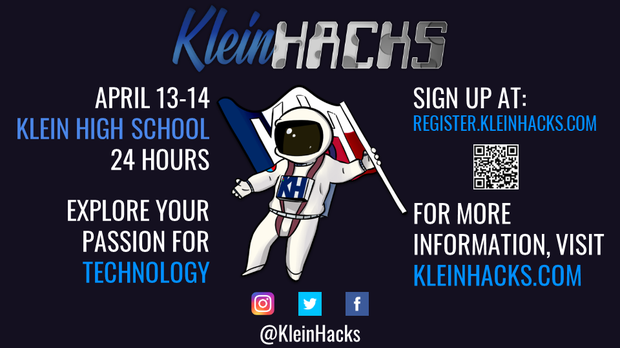 Beginning next week, teams of Klein ISD students will learn, design, and create applications next Saturday and Sunday at Klein High School’s second annual 24-hour hackathon. Last year, Klein Hacks had around 100 students attend the 24-hour event. This year, attendance is expected to double. If students want to register for the event, there is a form located on the KleinHacks webpage. In addition, the event will have more sponsors last year, ranging from local businesses that will provide food, to major tech corporations such as GitHub and Typeform. This year’s biggest sponsor is Microsoft. At KleinHacks, sponsors such as Chick-fil-A and Whataburger will provide students with free food. But when coming to the event, students are recommended to bring their own supplies such as laptops, blankets, water, and other supplies students may want to bring in while staying at the event. During the event, students will be able to win prizes by completing challenges and also by winning competitions against other teams. Even students with no programming skills can compete and complete the challenges. Before its inception, the KleinHacks team wanted to found a hackathon for high-school students in the Klein district that could replicate the atmosphere of a college hackathon. “Hackathons have been, for a long time now, a big thing within college students. Our founders last year wanted to bring that same experience to high schoolers,” Bauducco said. As of this week, only a limited number of spots are left, but the KleinHacks team is still encouraging students to register on the KleinHacks’ webpage.